Patriotic Red, White, and Blue Crafts and Party Decorations ~ These red, white, and blue crafts and decorations will add a festive touch to any Memorial Day or Fourth of July celebration. 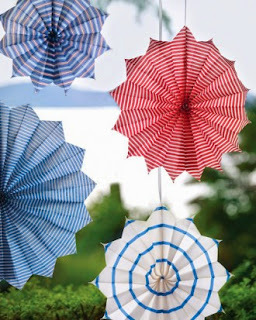 Clothespin Pinwheel ~ So pretty they'll make you dizzy, these patriotic whirligigs spin in the wind. 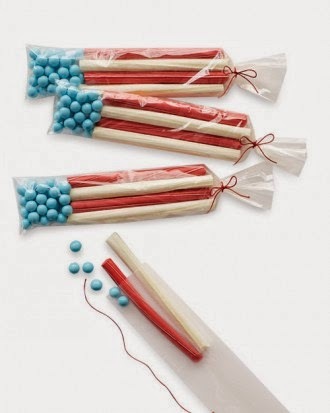 Flag Favors ~ A spirited holiday celebration calls for a fun take-home treat, like this goody bag of candies arranged to resemble the American flag. 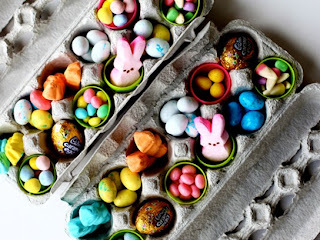 Start by partially filling a 2-by-10-inch cellophane bag with blue candies to stand in for stars. 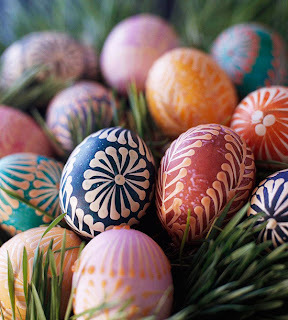 Then add red and white candy sticks to mimic stripes. Tie the bag with red waxed twine, and don't be surprised if you catch yourself humming "Stars and Stripes Forever." 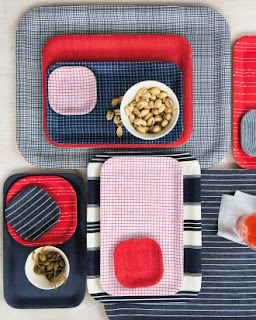 Cloth Decoupage ~ Transform affordable wooden plates with cotton in patriotic colors. 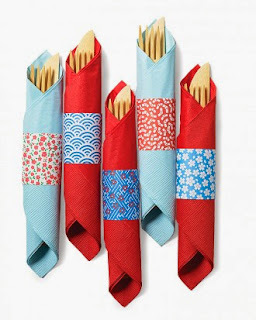 Paper Napkin Rings ~ Playful patterned cuffs spiff up paper napkins and make it a breeze for guests to grab their flatware at a barbecue buffet. 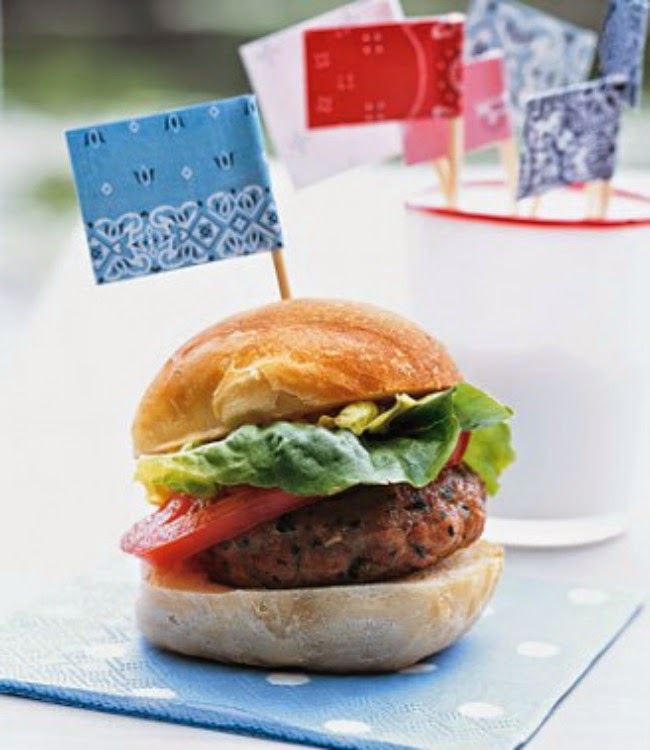 Using double sided tape, cut rectangles from festive scrapbook paper and affix around the silverware. 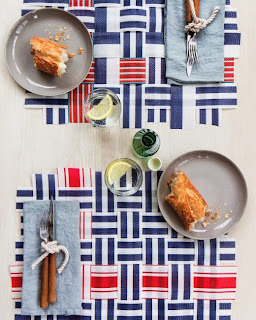 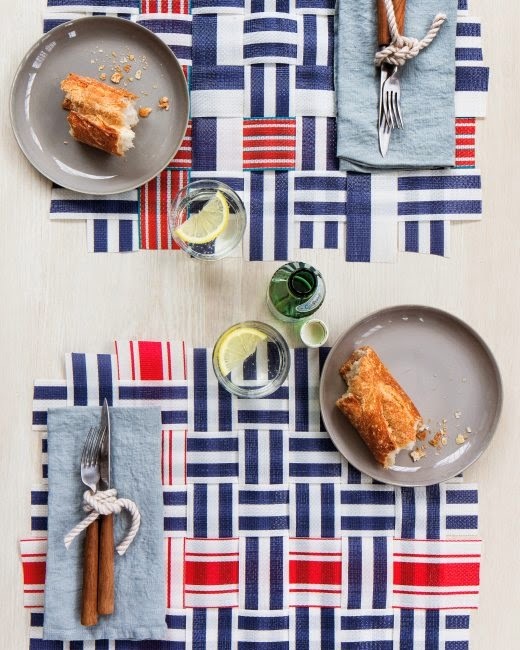 Patio-Chair Place Mats ~ These place mats are a playful homage to retro outdoor chairs, made from their replacement webbing. 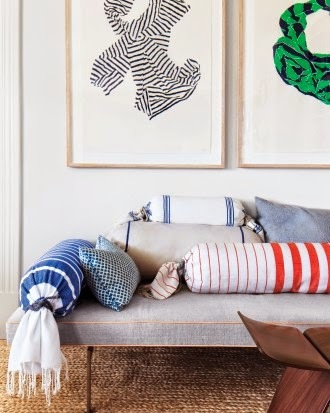 Patriotic Pillow Covers ~ Add hints of classic Fourth colors by taking a favorite fouta towel or scarf and turning it into a bolster cover. 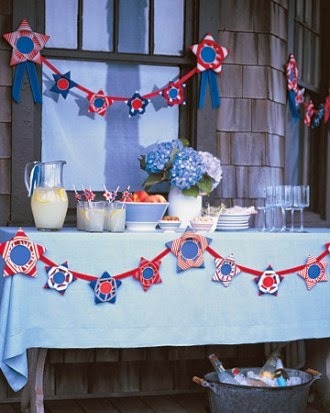 Paper Lantern Makeover ~ Give paper lanterns a patriotic makeover. To create a cascading star pattern, as shown here, cluster stars close together at the top of the lantern and paste stars farther apart toward the bottom and glue longer streamers to the bottom. Food Flags ~ Plant red, white, and blue banners in your burgers and anything else you're bringing to the picnic table. Cut small rectangles of festive scrapbook paper, fold around the top of a toothpick and pinch, hold together until secure. 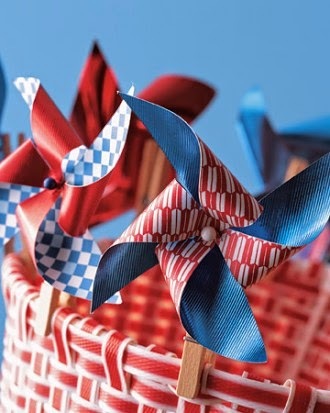 Rocket Favor Packaging ~ These red, white, and blue decorations will add a festive touch to any Memorial Day or Fourth of July celebration. 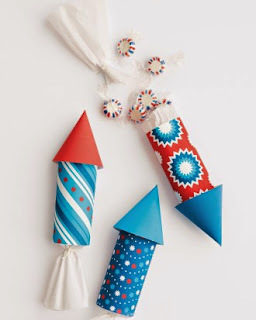 Your party guests will love these lively rocket favor packages for an Independence Day bash. 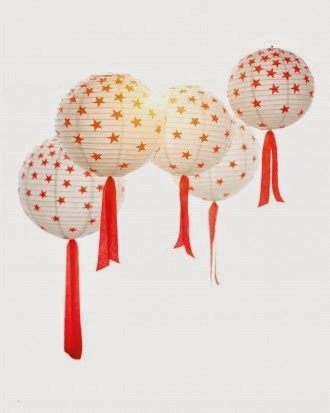 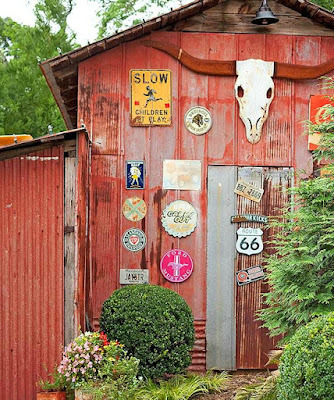 Star Medallion ~ Create daytime fireworks with these festive star medallions. 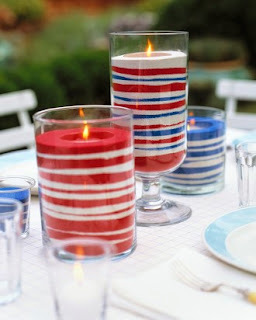 Easy Sand Castles ~ Red, white, and blue bands of sand dress up votive candles to make flickering lights that are cheerful and fun. Layered colored sand and "twist" in votive cup or tea tight. 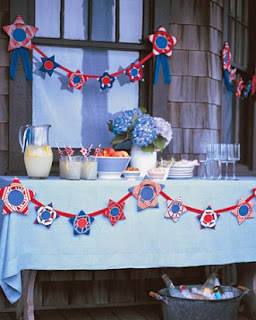 Red, White, and Blue Ribbon Stars ~ Use ribbons to create these patriotic stars of the party: garlands and festive straws that incorporate the colors and elements of the American flag. 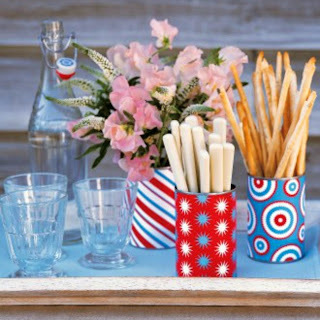 Can-Do Cans ~ Wrap up your holiday entertaining plans with these patriotic containers and fill them with flowers, utensils, breadsticks, and more. 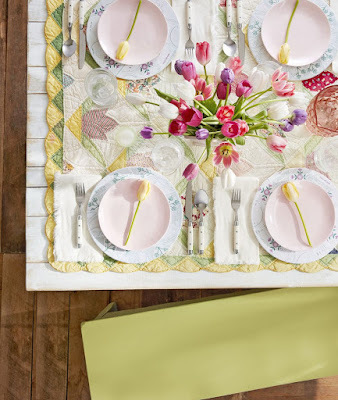 Using spray adhesive, affix festive scrapbook paper to a used, clean can and trim.